Capable of carrying up to 12 adults, these are the best way to get out on the water with your group, 6m x 3m enclosed all the way around, fitted with hydraulic steering wheel console, electric start, electric flushing toilet, running water with sink, 4 burner BBQ, cooking utensils, cooking oil, table, padded seating, 50L esky (ice availble at the boatshed shop) and a 30hp motor. Hire fee includes the boat, BBQ tools, BBQ gas, fuel, anchor and fishing licence exemption. All hires can only be driven during daylight hours. 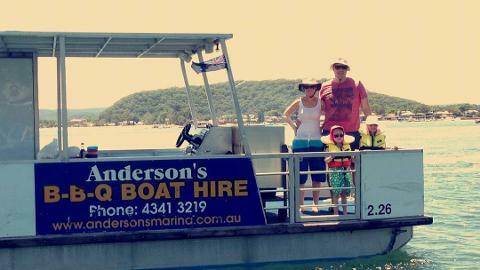 For more than 3 hours select Half Day BBQ boat hire option or Full Day.